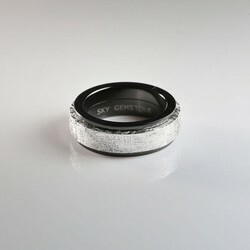 This meteorite wedding band is featured in its simple shape and playful spinning function: classic black stainless steel circle comes with a rhodium plated spinning meteorite ring. 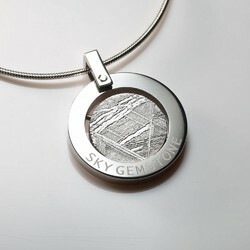 It’s a unique piece to represent your personality and also a great gift for a special man or woman. ◆ Please note that the price is for one ring. ✧ Cast your mind back to yours lucky days: The day the one who broke into your heart as a meteorite, the romantic evening that you made the commitment, or the sunny day you started the journey for two…these special days come back every year, and always make us smile, also like the annual visitor - the meteor shower - sparkle, beautiful, again and again, year after year. 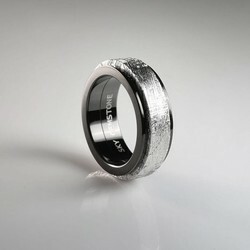 - Please measure the ring with wide width-over 5mm, to get your ring size. 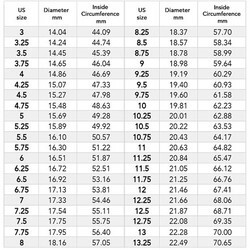 There might have ¼ - ½ of ring size difference between the regular width ring and wide width ring, it’s not the measurement, more like friction(e.g. 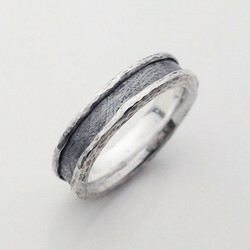 if you wear size 10 for wide ring, you might need 9.75 - 9.5 size for regular width ring). 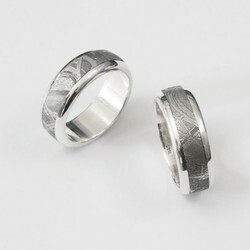 - Make sure the ring size that you order is correct, if you need to exchage the size, we do not cover the shipping fee. Also, returns or exchanges not allowed on customized ring. The greatest thing about owning meteorite jewelry is that's always a unique piece, each piece will show similar pattern but never exactly the same. And meteorites are never perfect. It might be small inclusions and marks, that is because they are all natural, isn't it a great thing to own natural beauty of defective? ◆ When we make the jewelries, we would treat them like our own babies - always select the superior and pristine material to begin their journey, after the several steps of unique design artwork and the master exquisite skill, the stunning jewelry finally come to meet you here! In addition, our jewelries are processing special treatments to prevent the oxidation, you can wear them every day. Let these fabulous gizmos light up your fantastic day. Please contact us for more detail about meteorite ring ! To make sure our clients are happy, we love to hear anything from you!